The moon and the Earth have always been portrayed romantically by most, due to their mutual attraction toward each other by the force of gravity. Scientists from Osaka University have recently discovered another factor which contributes to their mutualism: oxygen from the Earth’s surface may be travelling all the way to the moon’s surface. This oxygen seems to lodge into the lunar soil and has been occurring for the last 2.4 billion years according to scientists. This process occurs only for 5 days of the moon’s 27-day orbit around the Earth. Why so? 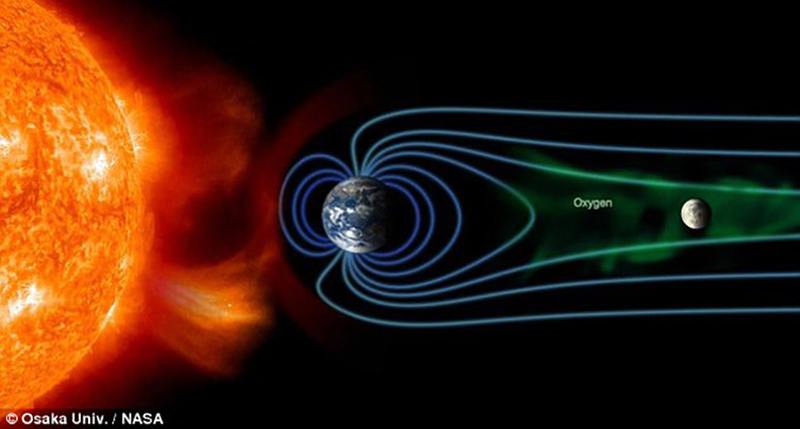 It is because the moon is constantly being blasted by the solar winds – winds that contain highly charged particles emanating from the sun’s surface. During the 27-day orbit, the moon comes under the Earth’s magnetotail. A magnetotail is the part of the Earth’s magnetic field which faces away from the sun. So when the moon comes under it, it is shielded from the solar winds. Thus, allowing for the oxygen ions in the Earth’s magnetotail to reach the moon’s surface. The process has been suspected by scientists for quite some time, but the evidence popped up very recently. After soil samples from the moon were examined, it was concluded that other gases like nitrogen and noble gases, have reached the lunar surface by the same method. This lead research was conducted by the astrophysicist Kentaro Terada and his team. A spacecraft was launched in 2007 which was nicknamed Kaguya. This spacecraft had orbited the moon for a year and eight months, bringing back with it a bundle of data which solidified this amazing discovery. During the orbit, the researchers had noticed something interesting. When the moon was under the Earth’s plasma sheet (the hot region consisting of charged particles trapped in the Earth’s magnetotail), Kaguya’s detector picked up high-energy oxygen ions. It was then concluded by Terada and his team that the ions were coming from the Earth, and not the solar winds. These oxygen ions were able to travel to the moon’s surface by the push of the Earth’s electric and plasma fields. Since these oxygen ions are high-energy, they are able to lodge into the lunar surface of 100 to 1000 nanometers in depth. The oxygen has been lodging for over 2.4 billion years, which means scientists may be able to find traces of the Earth’s ancient atmosphere in there. Terada argues it will be difficult to do so because it is hard to distinguish the oxygen ions from the Earth and the ions from the solar winds. The moon and the Earth are not just physically connected to each other by the gravitational and tidal forces. They are also chemically connected now that oxygen from Earth makes itself home on the lunar surface despite the distance.